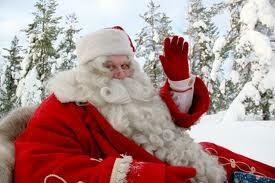 Will it snow on Christmas for the first time in my memory? I had never seen snow falling outside the window while my Christmas tree lights were on until last Saturday. So I already feel like I've seen everything. The first is Nutella Hot Chocolate. It's been popping up all over the Internet this season. And it's one of those ideas that's so smart, all I can think is, "what a great idea!" I've tested enough hot chocolate recipes to be able to say with confidence that the very best hot chocolate is made with a few squares of good-quality chocolate melted in warm milk. As a Nutella fan, I think this goes one better. Just put 3 tablespoons or so of Nutella in a small saucepan, add a couple of cups of milk, and stir it over medium-low heat. Put out a hot cup of either one for Santa. The Dude is going to need to thaw out his fingers if he's going to pull anything out of his sack for you. Enjoy either, or both, stay warm, and I'll see you in 2011. Combine the butter, brown sugar and molasses or dark rum in a small bowl and mash with the back of a spoon or fork to combine it into a paste. Refrigerate until ready to use. Place 1 1/2 to 2 tablespoons of the mix in a mug (the amount depends on the size of the mug and how sweet you like it). Add 1 ounce rum. (I like dark, but any rum will do.) Fill the mug with boiling water, stirring until the butter mix is melted. Top with whipped cream if you insist. In my column Wednesday, I suggested that everyone needs a "little black dress" appetizer for party season, drop-dead easy stuff that you can throw together and transport easily, and that always pleases people. The simpler, the better. From Ann: Kalamata olives and mascarpone cheese. Basically equal parts, food-processed. This recipe started with olives and homemade mayonnaise, but the substitution of mascarpone really simplies it. Toasted baguette slices. You're done. It's best to process the olives first, until well-chopped. (From Kathleen: Pitted olives, of course. That should go without saying. Or maybe it needs to be said.) Add cheese, softened, and mix well. From Marna Polhill: Mix an 8 ounce package of cream cheese (1/3 less fat variety is fine) with at least 1/4 cup of good-quality Vidalia onion relish. I purchase mine, Georgia Vidalia Onion Relish from Hillside Orchard Farm in Tiger, Ga., at the Handy Pantry gas/grocery/vegetable market across and down a little from Miller's vegetable stand below Pineville going toward Fort Mill. Anyway, mix cream cheese, relish and serve with crackers. From Jane Loveless: This is a recipe from my cousin April Morrow. April's Chicken Spread: One large and one small can of canned chicken (white-meat only). One large and one small block of cream cheese. One pack of ranch dressing mix. Set cream cheese out to soften. Drain chicken. Mix everything with mixer, carefully dodging flying pieces of chicken as you get started. Recipe can be adjusted by using more or less cream cheese or chicken, but never use more than one pack of ranch dressing mix unless the recipe is doubled. Best eaten with bagel chips. It's also better if you make it the night before so the flavors have time to blend. Sue Clark, Matthews: Take a sheet of wax paper and sprinkle heavily with chili powder. Use a package of Velveeta unwrapped and the sides moistened with a little water. Roll in the chili powder until completely coated. Place on a pretty plate and surround with crackers. They all want the recipe. Dotty Dysard, Matthews: Put some green pepper jelly in a dish. Open a container of spreadable cream cheese. Arrange Ritz crackers on a plate. Put a spoon in the jelly and a spreader knife in the cheese. Demonstrate by spreading the cheese on a cracker and adding a dab of jelly. Eat one. Oh, and eat another one, too.They're really good. Skippy Krell: Santa Barbara Mango with Peach Salsa, available at Costco behind the meat section. No substitution! Tostitos whole-grain scoops. Arrange partially drained salsa in a glass bowl with scoops in a basket nearby and watch it all disappear. Katie Rozycki was the first to respond correctly with where I had lunch: The restaurant was Halcyon: Flavors from the Earth, at the new Mint Museum uptown. 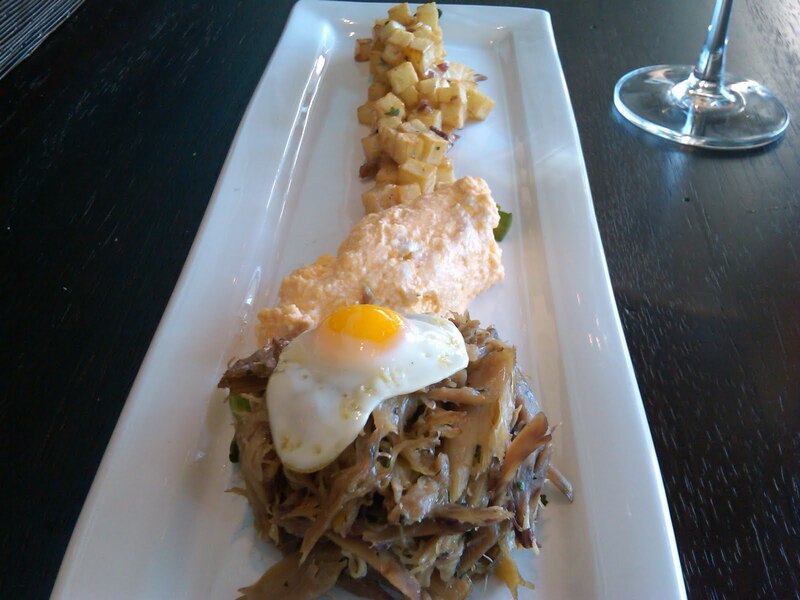 The inventive menu is the work of Mark Jacksina, who developed a following at Lulu among others. The dish, by the way, is the Poulet Plate, just added to the menu this week. That's dark-chicken confit topped with a fried quail egg, a sort of deconstructed German potato salad on the end, and my favorite thing on the plate, a delicately fluffy scoop of cold butternut squash ricotta, in the middle. The restaurant has such a strong local-food mission that there is no freezer and only a small walk-in refrigerator in the kitchen, so they're forced to keep it very fresh and local. It's a beautiful space, right at the top of those very high front steps, with soaring windows and lots of natural wood and stone touches. You can get a look the menus (not updated with new stuff added this week, but you'll get the general idea and the price range) at www.halcyonflavors.com. Thanks, everyone, for playing. And Katie, the copy of the cookbook "Plenty" will be on the way to you soon. Having two holidays in a row fall on Saturdays is great for long weekends, but not so great for Saturday morning farmers markets. So some markets are making special plans to get your New Year's collards and Christmas breakfast bacon. At the Charlotte Regional Farmers Market, 1801 Yorkmont Road near Billy Graham Parkway, a small group of local farmers plan to be on hand from 10 a.m. to 2 p.m. Wednesdays to sell whatever they can salvage from those freeze-ravaged fields. The Matthews Community Market, 188 N. Trade St., will hold holiday markets from 4-6 p.m. Wednesday and again next Wednesday. The Atherton Market, 2104 South Blvd., will be open 3-7 .m. today and 9 a.m. to 1 p.m. Wednesday, then will close until Jan. 4. Shall we play a game? Take a look at the picture above and tell me where I had lunch today. Hints: It's very new, with an old-favorite chef. Email your guess to me at kpurvis@charlotteobserver.com. Deadline is noon Tuesday (that's tomorrow). I'll announce the restaurant - and identify the plate - at that time. Oh, and one more hint: It was delicious. Want to buy a N.C. barbecue battle? When the Barbecue Battle Box arrived on my desk, packed in a cooler of freezer packs, I had to admit: Clever idea. 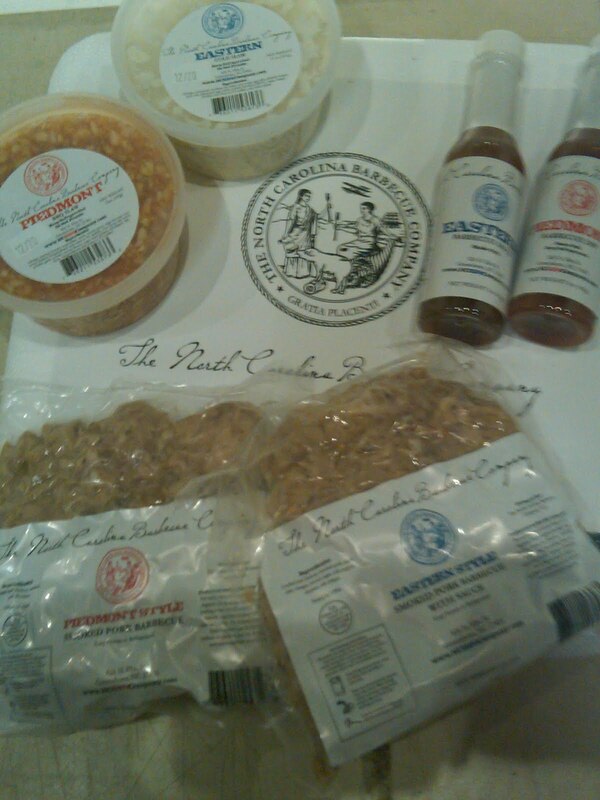 It's $59 ($39 if you buy 10 or more for a "Corporate Gift Special") and it comes with 1 pound of Eastern-style pork, 1 pound of Piedmont-style pork, one bottle each of Piedmont Dip and Eastern Barbecue sauce, and two tubs of cole slaw, a red Piedmont style and a white Eastern style. The battle idea is that you're supposed to decide which style of barbecue is better. But you know barbecue fans -- we spend our time deciding whether this particular sample is a good example of the art of True 'Cue. 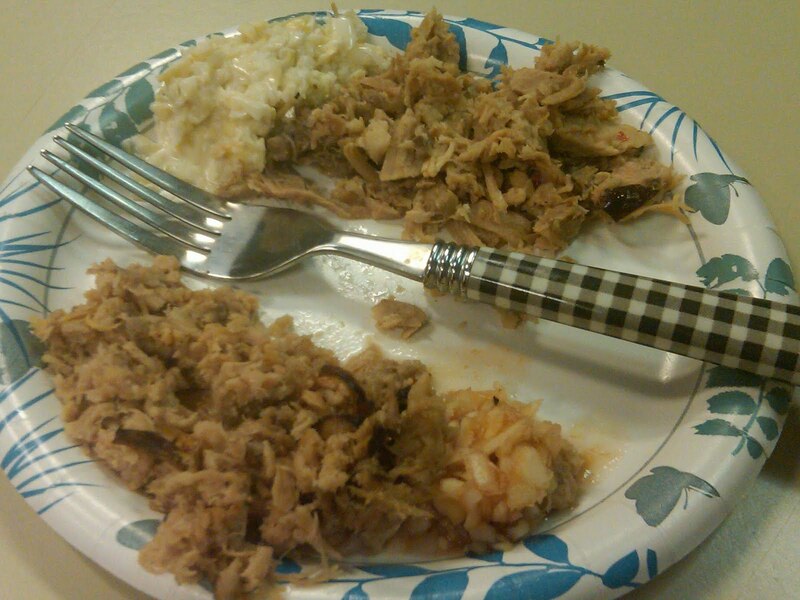 So I microwaved the barbecue packages, called together a small coterie of seasoned co-workers (and ended up with a large coterie -- you try putting out a couple of bowls of barbecue at lunch) and we commenced to tasting. 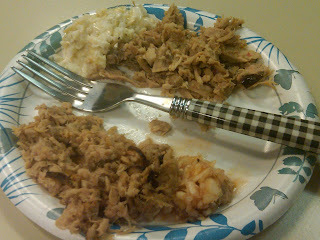 The slaws were big hits, with everyone loving the white and slightly sweet Eastern style, and even barbecue-slaw dislikers saying they liked that version more than they usually do. The sauces were pronounced reasonable facsimiles of the real deals. The barbecue was pronounced generally good, although there is no nitpicker like a barbecue eater. Several people wanted more smokiness, even though I reminded them that true N.C. 'cue isn't very smoky. We all agreed the textures were right, with the proper minced quality in the Eastern style and more shredded, chunky pork in the Piedmont style. The Eastern style, even before saucing, was noticably more vinegary. Price-wise, we all thought $59 was a mite high, considering that a pound of either one usually runs $8 to $9 at most of the classic places. As several people noted, "For 60 bucks, you ought to get banana pudding and some white bread." But still, I've run into pretty big barbecue fanatics from out of state who spend a lot more on a plane ticket, a rental car and several days hitting places like Skylight Inn and Bridge's. So if what you want is to get or give a taste of N.C., this is a pretty good way to do it. Interested? Go to http://www.ncbbqcompany.com/ or call 866-617-4467. The Society of St. Andrew is a great group that gathers unused food, usually from picked-over fields, and gets it in the hands of people who can use it. They could use help a couple of times this week. In Operation Food Lift, 9:30-10:30 a.m. Friday, they need a few people to help box up butternut squash and load it onto trucks. It's at a warehouse in Monroe, so Southern Mecklenburg and Union County volunteers would be great. On Saturday in Mooresville, they need help picking turnips and greens at 10 am. For details on either of these, email your name and phone number to Kristen Shaben at gleanclt@endhunger.org. House-Autry, the N.C.-based company that makes all kinds of things cornmeal, such as fish-fry and chicken breading, hush puppy mixes and cornbread mixes, has a recipe contest called "I'm Dreaming of a Fried Christmas." (And I'm just going to back away and let you make any joke you like about that.) The grand prize is that you get to make a cooking video that they'll feature at house-autry.com. The recipe has to use a House-Autry product and can't use more than seven ingredients. Deadline is Dec. 13 and you can get entry details here. If you've ever shopped at the Fisher Farm stands at the Matthews Community and Charlotte Regional farmers markets, you may not know that Dane Fisher, the guy selling all those heirloom tomatoes, tomato sauces and kale, is actually Dr. Dane Fisher, associate professor of biology at Pheiffer University. He's putting on his speaking cap (he doesn't talk much on cold Saturday mornings, I can tell you) and speaking at Discovery Place from 5 to 6:30 p.m. Friday for the Charlotte Area Science Network. He'll talk about the flavor, quality and nutrition of locally raised produce. Should be intriguing. It's free, but reservations are recommended. Call 704-372-6261, extension 300. I took this picture on a snowy morning last winter at the Matthews Community Farmers Market. But I almost got to replay it this Saturday at the Charlotte Regional Market: Sleet on the way there, tiny flakes of snow while I was shopping. I had to miss a couple of market weeks thanks to that turkey-choking calendar lump called Thanksgiving. So I took a quick survey: Apples are starting to dwindle, broccoli is almost done. Winter squash were hard to find because Thanksgiving shoppers wiped them out. Brussels sprouts haven't show up yet. But the kale is back! Dinosaur, Siberian, green. Regular readers know that is big news at my house. Go here for a repost of last winter's story about my struggle to find a way to get my husband to eat kale. It has a bunch of cool kale tricks, including the amazing crunchy kale chips. And it has one of my favorite recipes of the year, Tuscan Kale Salad. People ask for copies of it all the time and tell me they're addicted to it. 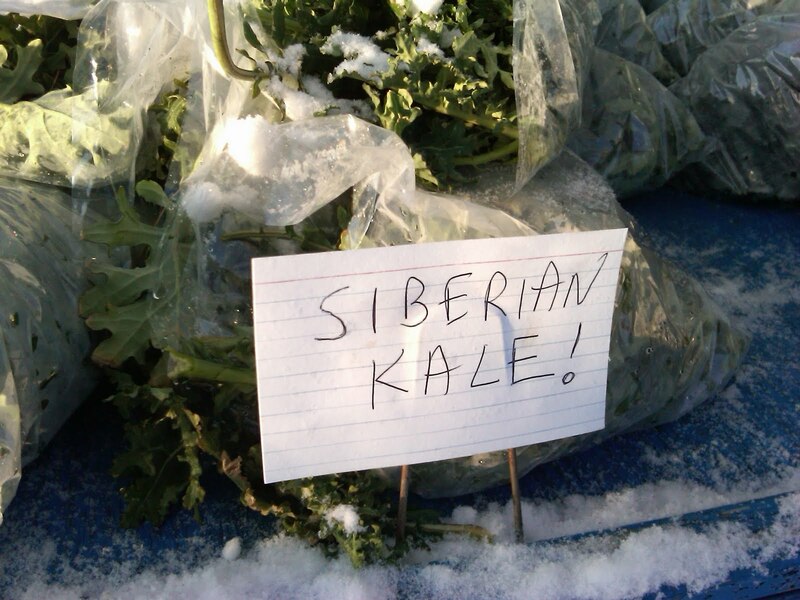 Seriously, raw kale. It's easy, fast and packs major flavors of lemon, pepper and garlic. Kale was with us until well into March last year, so keep this one handy. Trim off the bottoms of the kale stems and discard. Pile up the leaves and slice into ribbons about 1/2 to 3/4 inch wide. You should have 5 or 6 cups. Pile them in a large serving bowl or salad bowl. Toast the bread lightly, then pulse in a food processor or rub on the large holes of a cheese grater to make coarse crumbs. If you're using fresh bread crumbs, spread them on a pan and toast them lightly. Pound the garlic clove into paste in a mortar or with the back of a large knife. Place garlic in a small bowl. (If I use a mortar, I just mix the dressing right in it.) Add 1/4 cup cheese, 3 tablespoons oil, lemon juice, salt, pepper flakes and pepper. Whisk to combine. Pour over the kale, using tongs to toss well. Let stand at least 5 minutes and up to 15 or 20 minutes. Add bread crumbs, remaining 2 tablespoons cheese and a little drizzle of additional oil and toss again before serving. How is CPCC's culinary school like your house? Central Piedmont Community College issued an open invitation to the Charlotte media Thursday for a holiday reception at the Van Every Culinary Arts Building. It was one of the rare times when TV, indie and old-fashioned daily newspaper folks banged elbows. First, everybody hangs out in the kitchen. CPCC is justifiably proud of the spiffy, still-sorta-new culinary building, and they're smart enough to know that everybody wants to be where the action is. So all the food is put out in stations around the kitchen. It's not only practical - have the food where the stoves are -- but it makes the whole thing feel fun and relaxed, rather than the usual stiff work party. Second, everybody feels like they're being graded when people eat your cooking. In this case, students actually were: Prepping and serving food for the reception was part of their final exam. But they watch and take personally every reaction to every bite. Just like you do when you cook for a party. Thanks again to department head Bob Boll, all the student cooks and very efficient student waiters, and especially to chef-instructors Jim Bowen and Pam Roberts. I spend a lot of time at Charlotte's four culinary schools -- Johnson & Wales, CPCC, Art Institute and Community Culinary School of Charlotte. And what blows me away every time isn't just the food. It's how much the chef-instructors love those students. In the discussion over how we eat (local, not local, cheap, expensive), there are a couple of good pieces in the news this week. Newsweek's cover story looks at the divide between those who spend more on quality and those who have less to spend and make tough choices. The headline is a little misleading ("How Our Foodie Obsession Is Driving Americans Apart" isn't really the conclusion of the article). Lisa Miller's piece really shows more insight into the tough choices people have to make between quality and affordability. Meanwhile, over at the Washington Post's opinion pages, writers Brent Cunningham of the Columbia Journalism Review and former Post food writer Jane Black weigh in on the food-culture wars and how food choices are becoming class divisions. Ironically, the Newsweek headline would be more appropriate on this one. Taken together, they're both thought-provoking and the beginning of what is becoming a new way to define the choices we make about what -- and how -- we eat.